I recently purchased a Nikon 105mm macro lens, all I have to do now is learn how to use it. Your pictures look great. This is exquisite Misty, absolutely!!! Just about takes my breathe away. All I can manage to say is O M G!!! Stunning capture! Fantastic shot! Have a fabulous week! Beautiful shot. 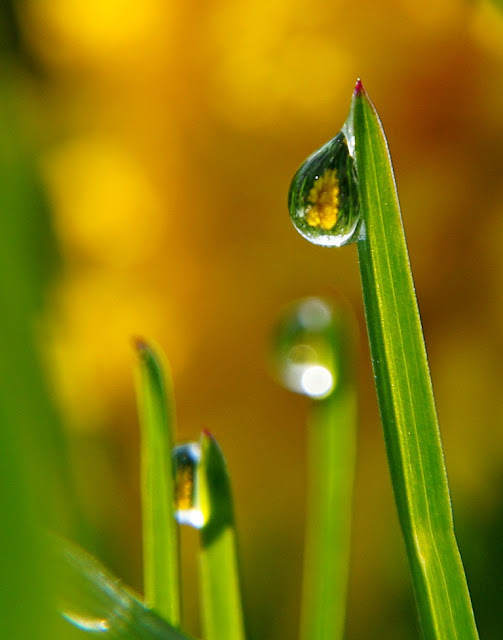 Love the yellow background (I'm guessing daffodils) that you caught in the waterdrop reflection. Maybe one of these days I will find an image like this and capture it. I have never seen a droplet with such a perfect reflection in it. Awesome shot and pretty, too. Such a magical macro! A sense of romance in this reflection!